For the purposes of avoiding nastiness in the comments section, let me make it clear that I love Mass Effect. I loved Babylon 5 and Star Trek: The Next Generation as a child, so when Mass Effect came out -- a game that was heavily inspired by Babylon 5 -- I fell in love with it. I think I must've played the first Mass Effect twenty times across different Shepards. It's actually my favorite in the series, barring its flaws. That being said, let me also make it clear that I love Samara, who was actually one of my favorite characters in the entire Mass Effect universe. For this reason, I always made a point of saving her during the Ardat-Yakshi monastery quest. 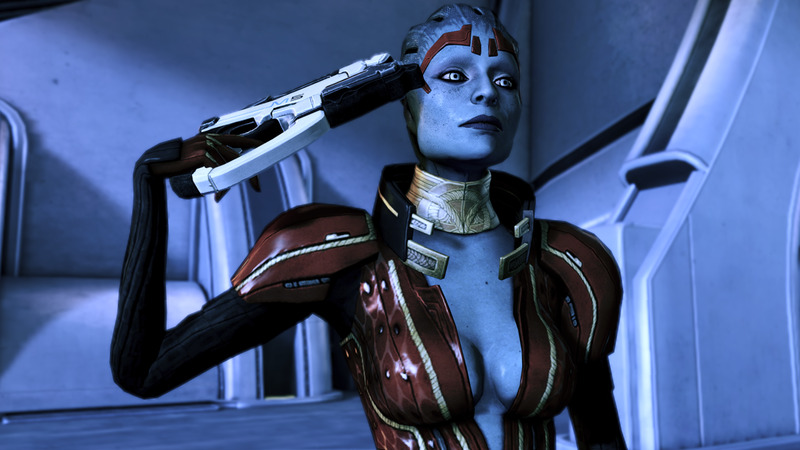 But recently, after deciding to play a more Renegade and pragmatic Shepard, I realized that allowing Samara to commit suicide and killing Falere actually makes sense given the situation and the lore. If you save Samara from committing suicide, Falere will promise that she won't allow the Reapers to take her alive. There is absolutely no reason to believe that Falere can keep this promise. 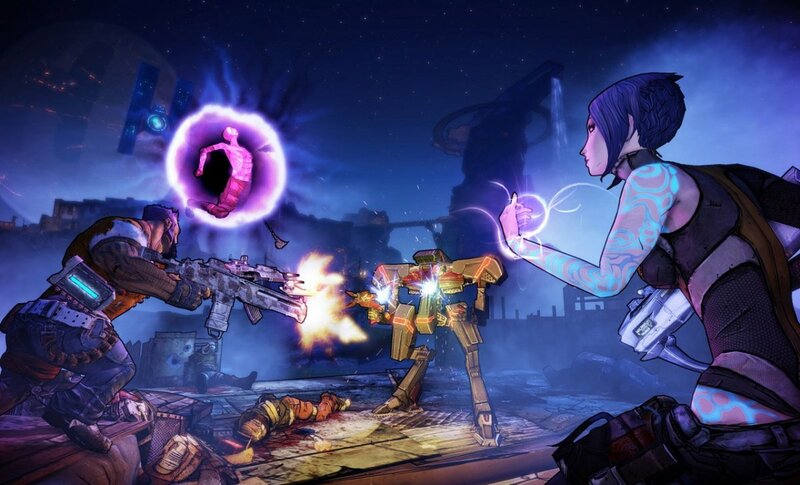 She is one girl with very weak biotics, as shown in the cut scene when she is fleeing Reaper soldiers. If the Reapers return, they will take her, same as they took Rila. Is Shepard willing to bet hundreds of people's lives on the chance the Reapers won't return? The monastery is still full of dead bodies they can use, after all. And since when have the Reapers been known to waste resources? And even if the Reapers don't return, you are leaving Falere alone to possibly starve or freeze to death in a ruined monastery. Leaving her alive makes no sense. Yes, there's an ending slide that shows Falere can survive her dismal time alone in what is essentially a graveyard, but Shepard can't see into the future, and pretending like she can is called "meta gaming." I'm not arguing that the Renegade choice is the "right" choice. I'm arguing that it makes the most logical sense. At a glance, it seems as if the Ardat-Yakshi have suffered a retcon, bad writing, or some kind of plot hole. 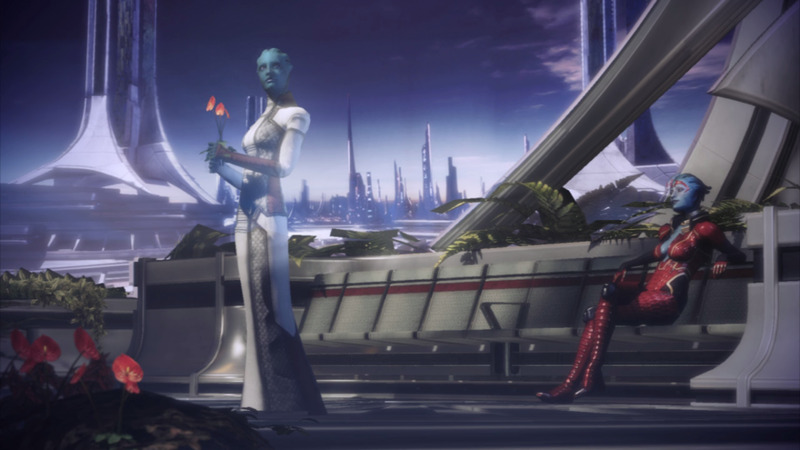 In Mass Effect 2, we learn from Samara that only three Ardat-Yakshi are in existence, with a few more possibly scattered on planets throughout the galaxy. When we get to Mass Effect 3, however, we discover that the monastery is full of them and they are being turned into banshees. For those who don't read the codex, this is largely the assumption. But according to the (slightly retconned) lore, Samara's three daughters are the only full-blown Ardat-Yakshi, alongside one other that was mentioned on a datapad. The other banshees were made from asari who carried the dormant Ardat-Yakshi gene. 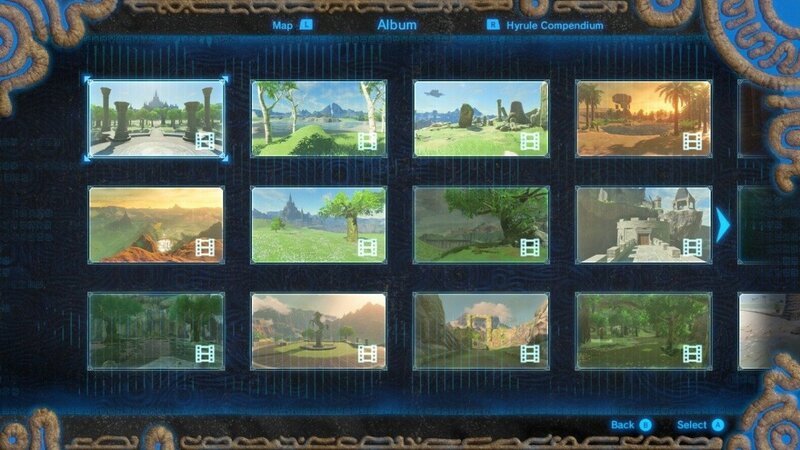 I admit, the game could have done a better job presenting the situation. It's implied by the quest and the codex that the people living in the monastery are mostly carriers of the Ardat-Yakshi gene who made the choice to live there, even though they don't have to, for fear of creating more Ardat-Yakshi. 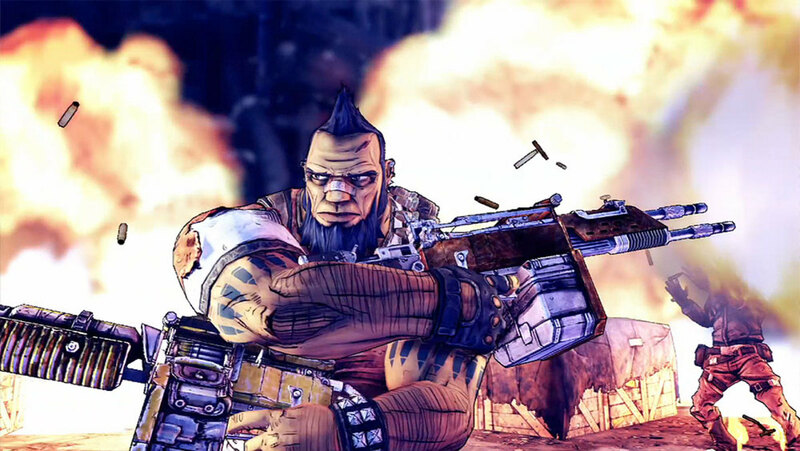 Shepard is sent to the monastery to kill all the Ardat-Yakshi and any gene carriers living there because they are susceptible to becoming banshees, which are very dangerous Reaper soldiers that can do massive amounts of damage. This is why the asari government wants the place blown up. For a Shepard who was friends with Samara and even "romanced" her (alas, mine did), going through the monastery is a bit tragic. Because the player comes to the slow realization that they might have to kill Samara's daughters and Samara, who is a gene carrier and is thus in danger of becoming a banshee. Given how incredibly powerful a biotic Samara is, it is actually pragmatic to kill her, rather than allow her to become a banshee and cause mass devastation. 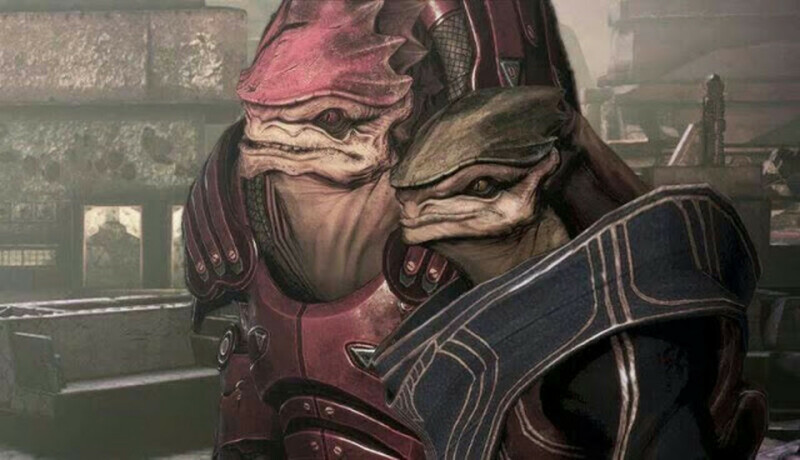 I'm not saying we should kill all krogan and turians because they can become brutes, but banshees are incredibly dangerous compared to other Reaper soldiers. 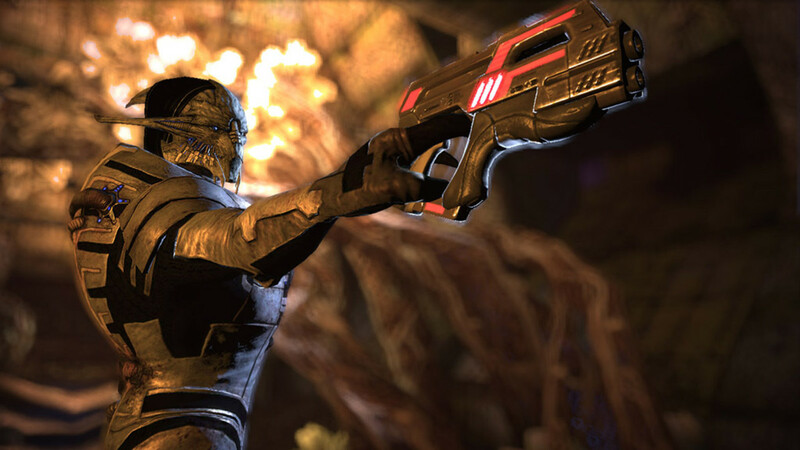 They are also rare enough that taking out just the monastery (and not all asari, since all asari can't become banshees) would easily take valuable resources from the Reapers. There's an argument that you don't have to be alive to become a banshee, so killing Falere makes no sense, as the Reapers would just make her corpse a banshee anyway. If that were true, why does Falere swear not to let the Reapers take her alive? Why did the asari bother trying to bomb the monastery? Why did Rila bother sacrificing herself? And why did Samara put a gun to her own head? Because the Reapers need the Ardat-Yakshi alive to become banshees. 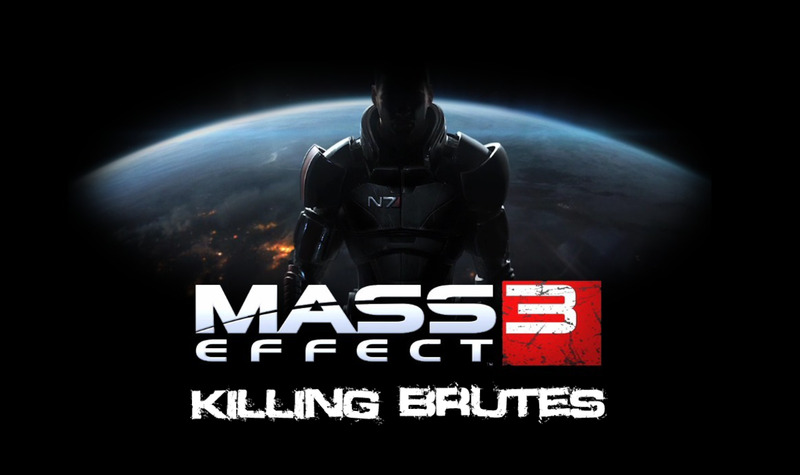 Killing Falere is a preventive strike against the Reapers, as it denies them one more powerful Reaper soldier. To be honest, though, the game is sort of wishy-washy about this. If you take Javik to Thessia, he mentions that -- during his cycle -- the Reapers turned their dead into soldiers and made them basically fight space zombies. So with regular Reaper foot soldiers, it doesn't seem to matter if a person is alive or dead. But where the banshees are concerned, the Reapers seem to need a living asari who is a full-blown Ardat-Yakshi or has the gene. So for the safety of others, Falere should be killed. Even imprisoning Falere would pose a threat, as the Reapers might attack the prison and turn her, unleashing her on innocent people. All Ardat-Yakshi and gene carriers should be purged during the Reaper War. Sad as it is, that is the grim reality, and being a Renegade means facing that grim reality. When Samara is about to commit suicide, she sums up pretty much everything I have said, pointing out that Rila's sacrifice reminded her of her own duty: to protect life by not allowing the Reapers to take her alive. Renegade is Not "Evil," Paragon is Not "Good"
A lot of players tend to think that Renegade Shepard is "evil" for killing Falere or that Renegade Shepard is "evil" in general. 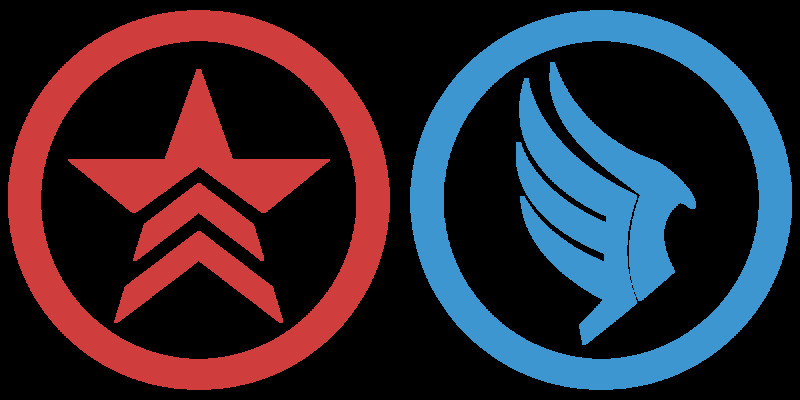 Actually, Renegade and Paragon are both just different ways to roleplay Shepard. Renegade Shepard is a pragmatic, realistic hero, who is not afraid to make sacrifices for the greater good. She doesn't kill people unless doing so is necessary and contributes to saving even more people. Some examples would include letting the hostages die over Terra Nova in order to stop Balak, a terrorist, from killing more people in the future. Or letting the workers in the refinery die during Zaeed's loyalty mission in order to stop Vido, a dangerous man, from ever killing innocent people again. Or killing Rana Thanoptis after she openly states that she's indoctrinated. Or killing the Rachni queen in the first game so she doesn't get captured again by the Reapers or Binary Helix or Saren or Cerberus or the Reapers and used to nearly slaughter the entire galaxy again. Renegade Shepard doesn't kill unless it's necessary to protect life. Unfortunately, being a Renegade meant sometimes being a jerk. Like punching Manuel, punching that pyjak, or shoving that mercenary out the window, actions I always considered unnecessarily cruel. But for the most part? Renegade choices are not "evil" but realistic and pragmatic. Meanwhile, playing a Paragon is about being an idealist. Paragon Shepard always chooses to see the good in people and always places faith in dangerous people to do what is right. This is idealism to the extreme, as doing so is often a great risk and potentially endangers the lives of others. 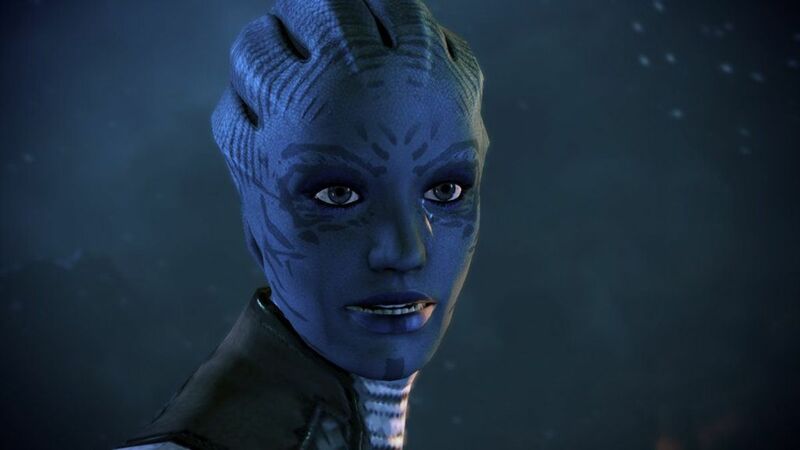 Letting Balak go in Mass Effect means that he kills more people later in Mass Effect 2, and letting Rana Thanoptis go in Mass Effect means that she also kills more people later in Mass Effect 3. If the developers wanted to be more realistic, they would have made it so that more Paragon choices actually backfired. With that in mind, it's always most fun to play as a mix and match of the two alignments: Paragade or Renegon. A Shepard with a mixed alignment is more realistic and more of a person rather than a cartoon. This was hard to achieve in Mass Effect 2, where the game punished you for not choosing one alignment by cutting off dialogue choices. Thankfully, Mass Effect 3 revamped the entire system, and players were allowed to make choices that were more in line with how they imagined their Shepard. 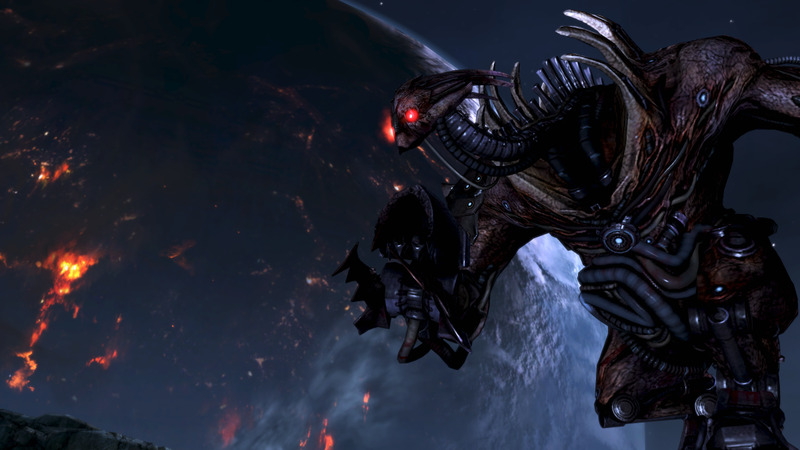 In the first Mass Effect, Shepard is purposely juxtaposed against Saren, the main antagonist. When talking to Anderson, it is established that Saren will kill hundreds of people to get the job done. Should Shepard point out that she would do the same thing, Anderson explains that there's a difference between what Shepard does and what Saren does: Saren unnecessarily slaughters large groups of people because he's "twisted and broken" and doesn't care about people's lives. He's an evil man who kills for pleasure and "enjoys the violence." This conversation with Anderson is meant to demonstrate that Shepard -- whether Renegade or Paragon -- is still a hero who cares about people. In Mass Effect 2, the Renegade interrupts slope Shepard toward behaving more and more like Saren -- I believe she can even be compared to Saren a few times -- and this is done to give the player a few opportunities to roleplay a Shepard who is going off the deepend and maybe didn't come back from the dead correctly. So you can most definitely roleplay Shepard as evil and going insane during Mass Effect 2, but by Mass Effect 3, Shepard has been pulled back from the brink by her much needed six month vacation, and the Renegade interrupts, dialogue, and choices are not meant to be evil. Most of them are meant to show how the war is tearing Shepard apart at the seams -- such as her punching Han Gerrel, which is admittedly satisfying but is also done at the risk of losing quarian support for the war. Even a Renegade Shepard who shoots Mordin is not doing it "just to be evil" but because she probably has a good reason (or believes she does). You can actually see her throw the gun away in disgust. In short, Renegade Shepard is not "evil" for killing Falere, as killing Falere is not pointless. Yet I've seen players responding to this choice as if Shepard were laughing maniacally when she pulls the trigger on Falere. In reality, Shepard states that she can't trust Falere not to get taken by the Reapers, regretfully shoots her, and then begs for Cortez to pick her up from the planet. Even Samara believed that Falere had to die. She says that killing herself is the only way to "save Falere," but I believe she wanted to protect Falere from the horror of being killed by her own mother, not merely spare Falere's life. This is especially poignant if Samara has already killed Morinth (whose face is very sad right before her mother kills her). I used to wonder "Why drag Falere out of the great hall if you're then presented with the option of killing her?" It's because Falere was hell-bent on stopping Rila from doing her duty, which was to die and not allow the Reapers to make her a banshee. Rila's last defiant line ("We are not your slaves!") makes this apparent. While Falere is protesting, Samara approves of Rila's actions and gives her a proud nod before turning away. Out of Samara's three daughters, Falere is the youngest and seems to be the most childlike and naive. She is roughly 400 years old, and yet, due to having spent the majority of those years locked away in a monastery, she is still very much a child. I can't recall correctly, but I think Falere was the one in the Lair of the Shadow Broker dossier who was pissed at Samara for chasing Morinth and childishly refused to understand why it had to be done. Rila, on the other hand, was presented as mature and understanding of her mother's dilemma and what had to be done for the greater good. With that in mind, one could interpret Rila as a Renegade and Falere as a Paragon. All that being said, though I don't agree that both choices are valid (as in logical), I do believe that both outcomes are valid/suitable for Samara's story arc. 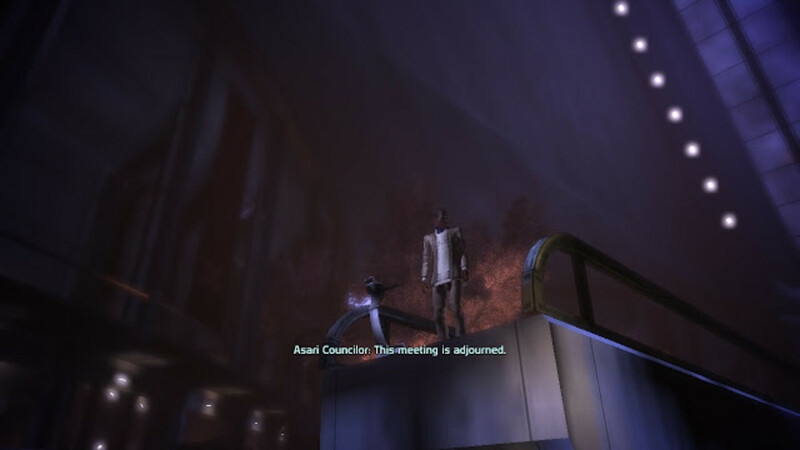 In Mass Effect 2, Samara is presented as a tragic figure. Her line about Morinth -- that she is a tragic figure but not one to be pitied -- can be applied to Samara herself. 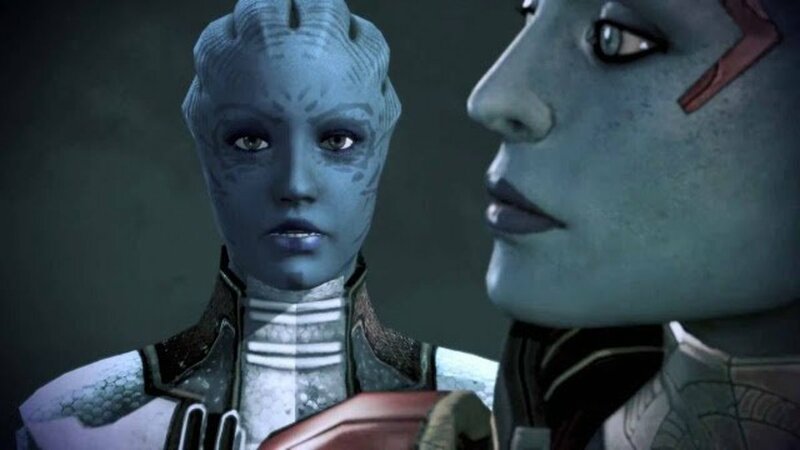 Samara decided to be with another asari, despite the very justifiable taboo against it, and as a result, produced three deadly killers, one of which was then unleashed on the world and killed hundreds of innocent people for hundreds of years. You can't help who you love, but you can decide what to do about it, and Samara chose to take the risk by being with another asari. This is probably part of the reason why she refuses to be with Shepard despite loving her: the last time she gave in to love, it was disastrous. To atone, Samara gave up everything she had and devoted her life to a strict Code that would give her no loopholes to wiggle around her duty. In doing so, she figuratively held a gun to her own head and forced herself to do what was right for centuries. She disciplined herself after lacking the discipline before to avoid a relationship with another asari. In the second game, Shepard can tell Samara not to be grim and fatalistic, and depending on the outcome you choose for her, Samara heeds the advice. If you're playing a Shepard who is realistic and pragmatic, then Samara's ending is as realistic and pragmatic, grim and rigidly Code-bound as her story always was. If you are playing a Shepard who is idealistic and makes decisions on blind faith, Samara decides to take a leap of faith and abandon her rigid Code (while pretending not to abandon it). Both endings are right for her character. One ending shows how bound she is to the Code, while the other shows how ragged she's been run by it. Mass Effect 3 is Samara's breaking point, the point where she can't take anymore and is willing to let the Code go, provided Shepard gives her a guilt-free way out. This is further demonstrated by the Citadel DLC. Back in Mass Effect 2, Samara refused to begin a romantic relationship with Shepard because she felt it wouldn't be right to find happiness while her daughters were still bound to the monastery and unhappy. 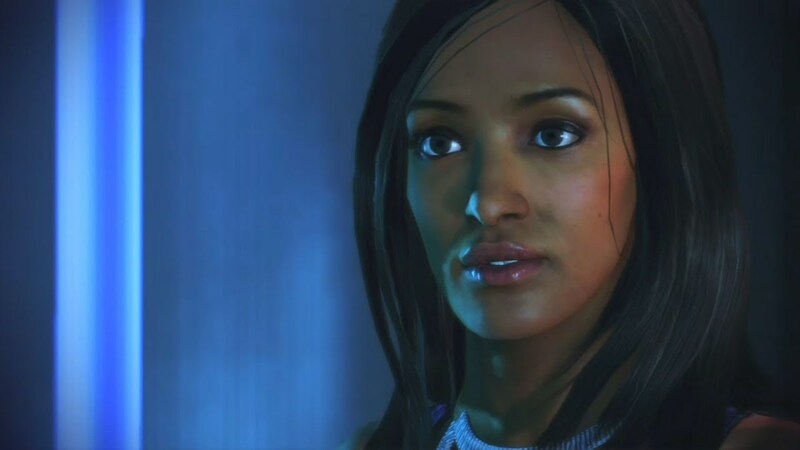 By Mass Effect 3, however, she is willing to kiss Shepard in Anderson's apartment, forsaking her previous convictions. Each Mass Effect 3 quest that features a cameo from a Mass Effect 2 character is meant to further define that character. But like most choices in the game, the choice to save Samara or let her die is all about defining Shepard. So the real question is: which choice is right for your Shepard?